Welcome to Friday's Fave Fives everyone. We're taking that moment to pause and recognize a few favorites blessings from the past week and share them. They can be big or they can be small, they may stand out or it may be that they took a moment to think of or to recognize. But taking that time to reflect on them helps us to take note of them a little easier when times are tough and to lead lives that are more grateful. Please join us. ~Mother's Day~ It was a lovely day all around. It started with a lovely card from my youngest daughter made me cry and her gift of a manicure, then delivery of lovely flowers from my older daughter and husband with a lovely note. 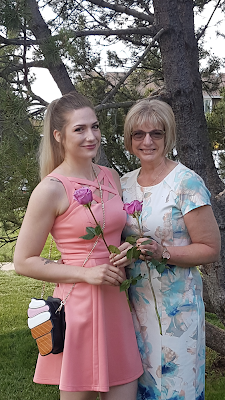 It continued with a great church service where my girl arrived with a starbucks coffee for me, then our traditional Mother's Day lunch of KFC with my mom over, phone calls from the above mentioned pair and then my son who was calling from Ottawa where he was on holiday. It was a gorgeous sunny day outside and I got some reading time in too. A lovely day. ~ Fern leaf peony bushes~ My mom has had them for ages. They are a smaller, more delicate bush and I don't see them in very many gardens. She blessed me with enough for about 3 bushes on Mother's Day. They are super expensive to purchase, at least around here, so I'm so excited to see them grow and fill in the flower beds. They bloom in the spring but throughout the summer the airy leaves will be a nice green background to some bright blooms of annuals. ~summer type weather~ Other than yesterday which was cold and rainy, it has been a gorgeous week. One of the days even set a heat record. We've been outside lots with the dayhome and we even had the water table out, which is always a favorite. And now the long weekend is looking to be wonderful too. ~forgiveness~ for those times when one totally blows it. ~from the heart conversations~ some great conversations were had this week with my younger daughter, who is 23. Conversations about life, about her new job and how it's going, about her trip to Italy this summer. It's such a blessing to have her share and talk to me about her life. What have been your favorite blessings from the week? That's a nice picture of mother and daughter ! We have rollercoaster weather, cold, hot, cold, hot etc ! What a great picture of you and your pretty girl!! Sounds like a great Mother's Day! We have had the students outside all week too minus one day when we had a downpour. I love peonies. My leaves look different though. I get pinkish white blooms usually in June. They are heavy and weigh the bush down but they're so pretty!! Great picture of you and your daughter. What a pretty dress you are wearing. I'm glad your kids made you feel so special and loved on Mother's Day. And, yes, it's lovely that our adult children enjoy talking with us! Peonies are probably my favorite flower. I don't think I've ever seen the fern-leafed kind before. Gorgeous! Such a lovely gift from your mom. Enjoy a weekend of beautiful weather. So glad you had such a wonderful Mother's Day! We just got a water table for Timothy last week - such fun! I had not heard of fern peonies - what a nice background! I've been wanting to try to plant some peonies this year. We have had some really nice weather, too - even hot a couple of afternoons, but otherwise very pleasant. I love those kinds of conversations with my kids. Amen for forgiveness. Lovely photo of you and your daughter. I'm glad you had a lovely Mother's Day. Yay for good weather. 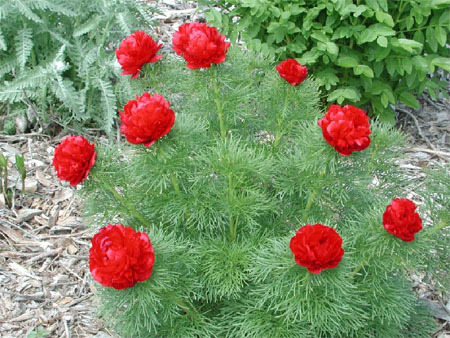 I've just planted a peony plant in my garden. Doesn't have fern style leaves though. Hopefully it will bloom - it was given to me as a present. Yes being able to talk to our kids is definitely a blessing - especially when they want to talk back. What a sweet photo of you and your girl! I love those peonies--I haven't heard of fern leaf peonies--I wonder if they will grow where I live. Warmer sunny weather is always a fave!! Our weather has been the opposite...one nice day amongst many cold and rainy ones. Getting a chance to chat with grown children is such a blessing. I'm late to the party this week, but I did finally make it!! a dozen things listed, hope that is okay with you. If not let me know. Blessings, and look forward to getting to know more about you hopefully.